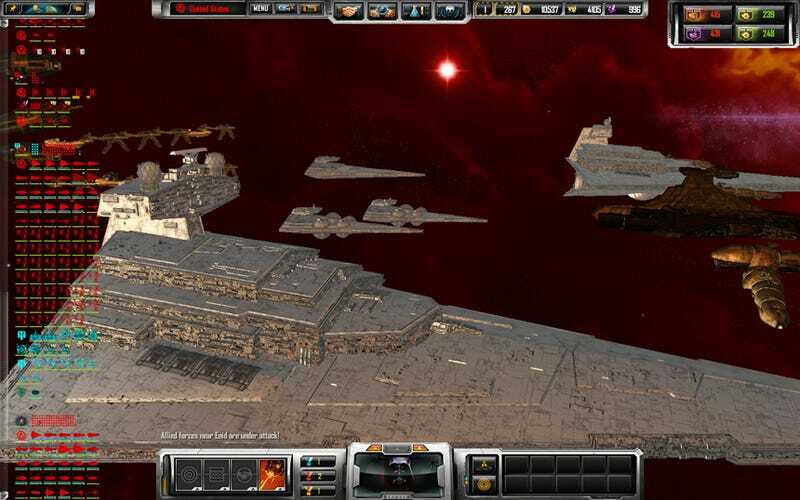 Star Wars: Requiem, a mod of 2008 PC game Sins of a Solar Empire that just received another update, is what a Star Wars space real-time strategy game should look and play like. Lead modder JasonF created an incredibly detailed mod that feels like a true expansion. Sins of a Solar Empire wowed PC gamers in 2008 with its massive galaxies and expansive tech trees. Taking the Valve approach, developer Ironclad has nurtured its dedicated and talented fans. In Star Wars: Requiem, which was initially released March 2009, the Empire and Rebel alliance join and transform the Sins of a Solar Empire universe. The mod has been a work in progress ever since, as new features including the introduction of the Rebel Alliance (originally excluded) were added in later versions. Version 3.1 was released June 24 2010 following in this tradition, adding abilities, ships and planet bonuses to the game. "The mod is much more than just a mesh replacement," said senior modder GoaFan77. "It adds Star Wars music, player portraits and symbols, unit picture and icons, planet bonuses, abilities and, in general, is perhaps the most complete mod that adds new races." New planet types were added to the game's original four (Terran, Desert, Ice, Volcanic). These include Industrial, Swamp and Oceanic planets to represent planets within the Star Wars Universe. All of them come with new textures and unique bonuses. For example, Oceanic planets are resistant to bombardment, giving them an hit-point bonus when under attack. Both Imperial and Alliance ships have received unique attributes, and abilities fans will recognize, such as a tractor beam, boarding party, and shield focus. Over 50 new ships were added through the collective work of multiple modders, with the biggest contribution coming from modder EvilleJedi, creator of the Homeworld 2 mod Star Wars: Warlords. The ships go beyond the run of the mill X-wings and Star Destroyers of movie fame to include starcraft from books and comics, such as the Dark Empire series. If you ever wanted to control the overwhelming power of Darth Vader's flagship Executor, now's your chance. "Unlike Star Wars: Empire at War, we used material from the expanded universe whenever possible," said GoaFan77. "No made up or little known ships [are] taking the role of well-known expanded-universe vessels, such as the lancer frigate being absent in Empire at War." Whether you are a Sins of a Solar veteran or a die hard Star Wars fan, Requiem seamlessly turns a 30-minute session into four hours. This is partially due to the incredible game engine the mod is built on top of. While gamers have been able to fulfill their fleet commander dreams in the past, Sins of a Solar is able to generate over one hundred conquerable planets on both pre-made, and randomly generated maps that are full of surprises. With additional details like movie screens of Luke Skywalker and Darth Vader for use as avatars, the armchair Sith out there can expect days of ecstasy as they trade, negotiate and crush up to 10 rivals. You can get the mod here. A copy of Sins of a Solar Empire is required.